Released in 1985, the original Mr. Vampire was directed by Ricky Lau and stars Lam Ching-Ying as a Taoist priest who battles the forces of evil along with his two inept students. This became a blueprint for dozens of other films -- some of them under the Mr. Vampire moniker and others not. 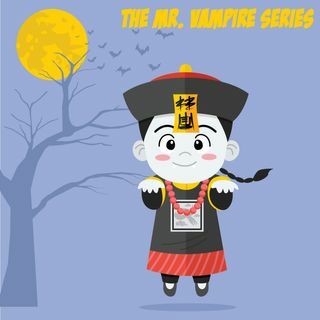 We discuss the “official” Mr. Vampire movies as well as the unofficial entries, some copycat films, and many other jiangshi movies along the way. Samm Deighan (Daughters of Darkness) and El Goro (Talk ... See More without Rhythm) join Mike to battle the forces of evil. Get your sticky rice ready!